For those claiming B&R 9 will work with ESXi 6.5 you missed a big caveat. It only works with hardware profile 11 VMs, profile 13 VMs wont be available to be backed up. Clayton, this configuration will work once Update 1 is released. We are aiming to make it publicly available early next year. We now have the Release Candidate build of Update 1, so those of you anxious to test Veeam Backup & Replication 9.5 against vSphere 6.5 are welcome to contact our support to get the supported pre-release code and participate in the pilot. Thanks! Is there a fix list available with RC U1 Anton, other than 6.5 support? Full release notes for this update will be available when it goes GA. Please note however that we stopped publishing complete "fix lists" for updates a couple of years ago, since it became too time-consuming to compile this list from R&D records with a few hundreds of bugs fixed in every update. However, support has access to the internal R&D bug tracker and can advise whether the specific bug submitted through a support case was fixed. In order to join the pilot and obtain pre-release version of update 1, am I correct in saying i just need to raise a support ticket (from My.Veeam) requesting this? Correct. Contacting support is what you need to do to participate in the pilot. Just an update...I reached out to support via a My Veeam web ticket asking to pilot the RC. Within 5 minutes, they sent me a link to download the RC for Update 1. They did say, however, that I cannot post the link to the download here, as they need to be able to track downloads to tickets, etc. I'll be testing out in lab with vSphere 6.5 and Nimble, and will post results with latest VM hardware profiles, etc. Another update. The RC successfully installed and now allows me to add the 6.5 vCenter server, and access the 6.5 ESXi hosts. 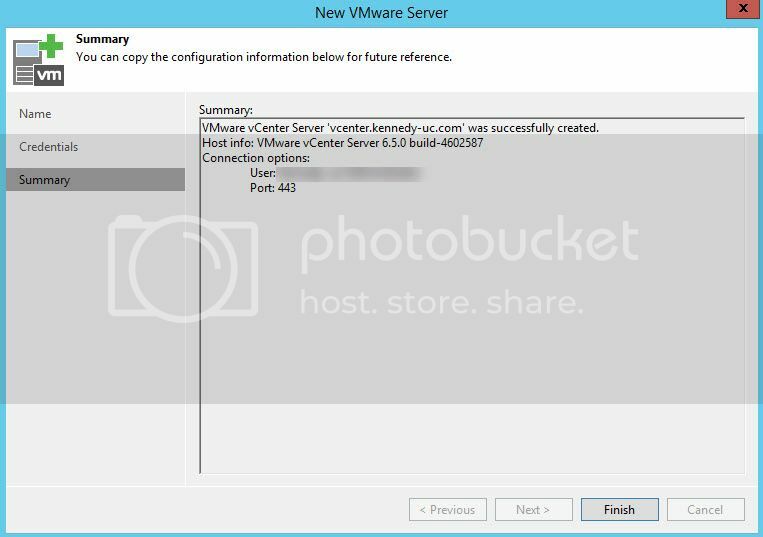 It immediately errored out before by saying the vcenter server version was not supported. I will say, however, that it took over 30 minutes to install on a Windows 2012 R2 based VM inside VMware Workstation, the VM having quad procs, 16gb ram, and running off SSDs. YMMV. I have had success with both backups and replication thus far. Successfully backed up 30 x Windows 2012 R2 VM's, including Exchange, AD, SQL, RDS, IIS, and various app servers. I have done a full VM Restore (inc registration) to an alternate ESXi 6.5 host in an isolated network, they were a DC, SQL and App server. I have power on the restored VM's and Veeam successfully took AD out of safe mode and auto rebooted, SQL and APP servers were fine. I have successfully replicated 14 x Windows 2012R2 VM's Exchange, AD, SQL, IIS, and an IP PBX. I have powered on the Replicas and Veeam successfully took AD out of safe mode and auto rebooted, SQL and APP servers were fine. I will now move to backup and replicate all VM's and continue testing! Thanks for all this detailed information. It is appreciated. Keep it coming . Please do let us know if you encounter issues and work with support asap so we can get those fixed in the final U1 release. Yesterday I upgraded from veeam 9.0u2 to 9.5 and I can no longer backup a standalone esxi6.5 host (it was working fine before....). Any ideas, when the 9.5u1 will be releeased, or should I go for RC? Bed?! Beds for sleepy people! Lets get a kebab and go to a disco!